I’m quite a foodie, so I hate to admit this, but I’m not going to lie…when I lived in the U.S. I always thought that parsley was just garnish. Whenever I saw “fresh parsley” in a recipe I usually just skipped it and left it out. It doesn’t add anything, right? I thought it was just a pretty green thing that sat next to your food on the plate. Boy was I wrong. Living in Albania I’m surrounded by so much fresh food. It’s insane. The little old ladies sitting on the sidewalk selling vegetables have so many things I’ve never seen or heard of before. Okay probably because half of them are weeds and grasses that we don’t eat in the U.S., but still. My curiosity always gets the best of me. 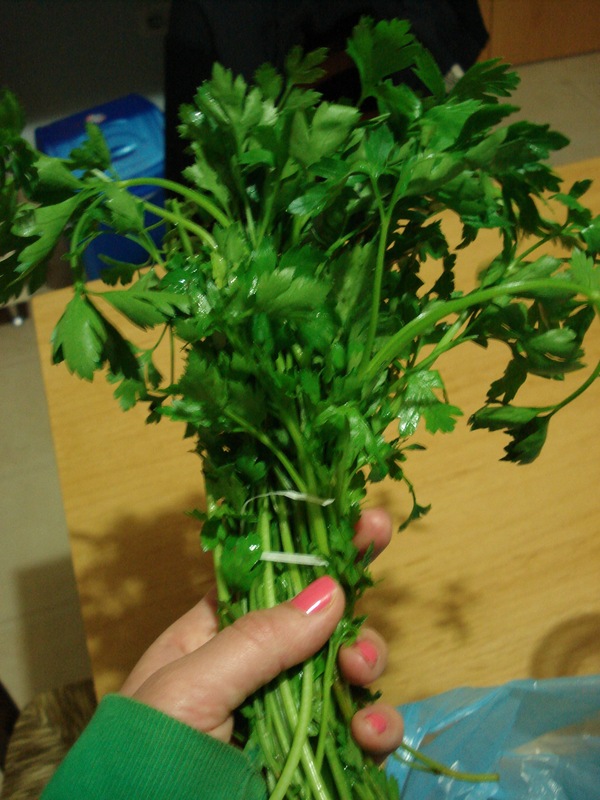 So the other day, my little vegetable man didn’t have change for my 200 leke bill so he gave me a bundle of fresh parsley instead (this is a pretty standard occurrence but it works out in the end because if one day I don’t have exact change either he just gives it to me for free). At first I was kind of annoyed, thinking what can I do with parsley?! But how I supposed to know that in hindsight, this moment would be life changing? So I took my parsley home begrudgingly and decided to look up some of those old recipes with parsley that I’d left out in the past and gave them a second try. Waist not. And what did I discover? Ooohhh myy good. Parsley has a flavor! And it’s delicious. Go figure. And it honest to god makes a huge difference in the flavor profile and the palette. I was trying to make before. How would’ve thought. Lesson learned- don’t question the recipe. 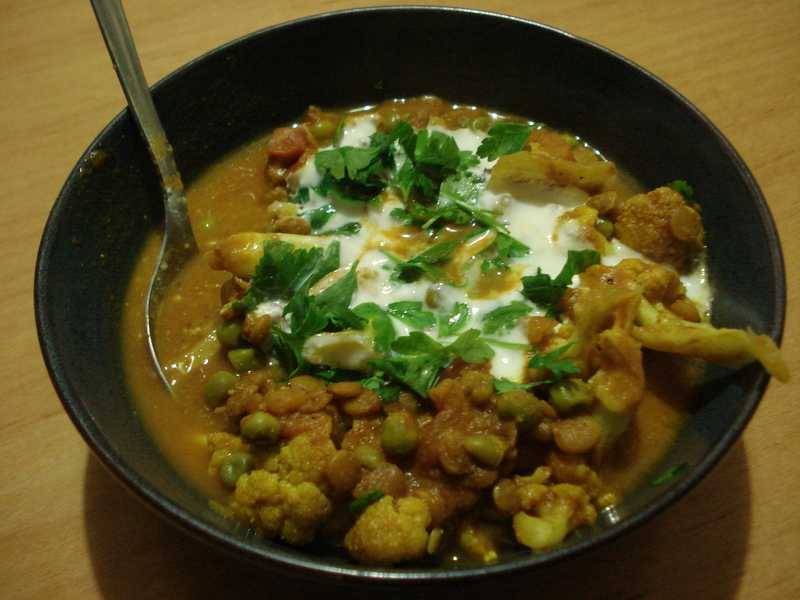 My first try was with curried cauliflower and lentils. I added some homemade yogurt and fresh parsley on top this time. I’m telling you, don’t skip it! Spend the extra 10 cents and get the fresh parsley (well that how much mine costs here at least). I promise you won’t regret it. The parsley completely changes this dish. It adds a level of freshness that’s indescribable. The curry is pretty spicy so the yogurt helps add a cooling effect and the parsley has a little bit to it that cuts through the spice and brings out the flavor of the veggies. Incredible. Combine lentils, onions, curry powder, salt, turmeric and water in a large saucepan over low heat; bring to a simmer. Cover and cook, stirring occasionally, until the lentils are soft and the sauce has thickened, about 45 minutes. Add tomatoes, tomato sauce, yogurt, cauliflower, peas and simmer, covered, until the cauliflower is tender, 8 to 10 minutes longer. Remove from heat. Heat oil in a small skillet over medium-high heat. Add cumin seeds and cook for about 10 seconds. Add garlic and ginger; cook, stirring, until the garlic is lightly browned, about 1 minute. Stir in cayenne and immediately add the oil-spice mixture to the cauliflower mixture. Stir in lemon juice and top with fresh parsley and a dollop of yogurt. My next adventure was with homemade tabouleh. 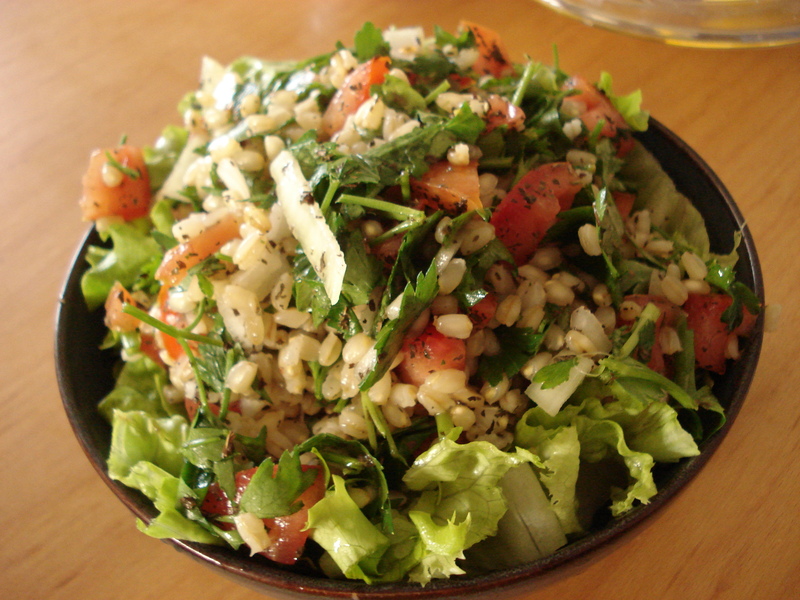 Now this dish is really amazing because fresh parsley is the star, not a topping. So splurge and buy a few bundle of fresh parsley and rock out this recipe. Best lunch I’ve had all spring. It’s so refreshing with lemon squeezed on top and its chock full of fresh veggies. I ate my tabouleh on top of a bed of lettuce, but you can also eat it plan or with pita, tortilla chips, whatever your little heart desires. Soak bulghur in cold water for 1 1/2 to 2 hours until soft. Squeeze out excess water from bulghur using hands or paper towel. Combine all ingredients, except for salt, pepper, lemon juice, and olive oil. Line serving bowl with grape leaves or romaine lettuce, and add salad. Sprinkle olive oil, lemon juice, salt and pepper on top. Serve immediately or chill in refrigerator for 2 hours before serving. It’s amazing to me how fresh and delicious produce tastes in Albania. Everything is just a little be sweeter. Maybe it’s the lack of preservatives and the fact that they were grown in my neighbors backyard and didn’t have to be picked unripe, sent on a cargo plane, and sifted through at a warehouse before reaching my plate. Food in Albania is naturally organic, naturally fair trade, and naturally delicious. Never in my life would I think of biting into a fresh lemon but now I eat one at lunch almost everyday. I’m going to miss this when I go back home, that’s for sure.